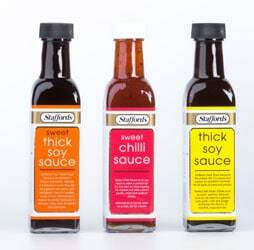 Stafford’s has redesigned its packaging to integrate its heritage with modern design – and the end result is striking. As part of the redesign by agency Creative Juice, the Stafford’s logo is now embedded in a band of gold reinforcing its quality heritage. “We wanted to highlight a clear and consistent brand identity across our full range of products making them instantly recognisable to consumers even though they are vastly different,” explains MD Chris Lewis-Enright. “This new packaging icon is now strategically placed on every Stafford Bros & Draeger product as a symbol of our quality guarantee, ensuring that we make the best use of the few seconds we have in the supermarket aisles to attract and hold consumers’ attention. Lewis-Enright is confident that the attention grabbing, informative designs will significantly boost the on-shelf presence of Stafford Bros & Draeger products, “essential in a highly competitive marketplace”. “We have found that most of our brand’s value is through its packaging. As an independent brand we focus most of our efforts in-store. We do not have huge marketing spend to push the values of the brand through above the line or print advertising. “We need to capture the essence of the brand on the shelf, and try and depict the quality in a very short time frame. Over the years our customers have learnt to trust our brand for its quality and dependability. We wanted to keep our existing customers loyal whilst extended the brand to new users,” he concludes. Stafford’s labels are produced by GM Graphics.